When you live in Africa, love the smell of nature and its strong call, and perhaps even more importantly, understand the natural cycles; you see the death of wildlife as part of the natural order. The strong conquer the weak, the old give space to the young. When you look at a magnificent animal and predator die in an area which is desperately (and successfully) trying to rehabilitate natural corridors of flora and fauna over a previously devastated land, no one would think less of you for shedding a tear. 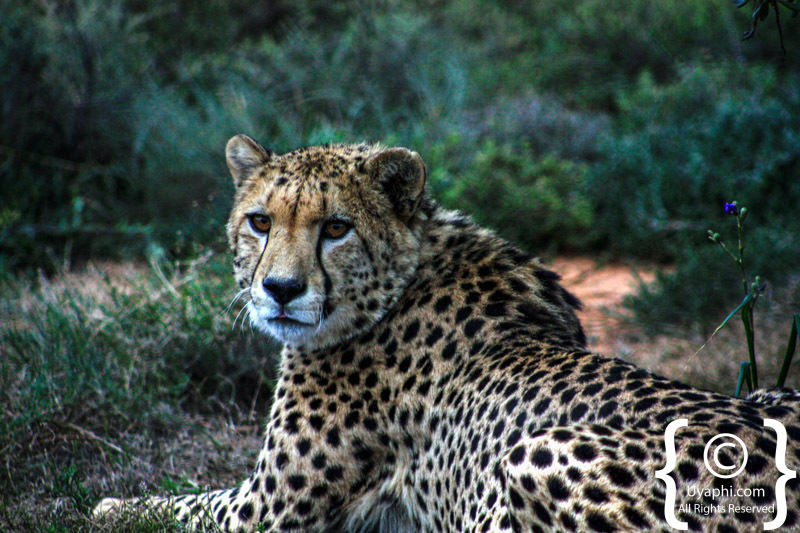 At the end of August, we said goodbye to Bellini, a prime female cheetah at the Samara Private Game Reserve near the historic town of Graaff Reinet in the Karoo. Thanks to the determination and foresight of an expatriate couple, Samara has reclaimed over 70000 acres of overgrazed farmland which has been rehabilitated to natural Karoo bush. This area of the Karoo was part of an extensive migration route which saw the traverse of millions of springbok. Black wildebeest, zebra, oryx, eland, blesbok, Cape lion, rhino, and the iconic cheetah have been reintroduced. 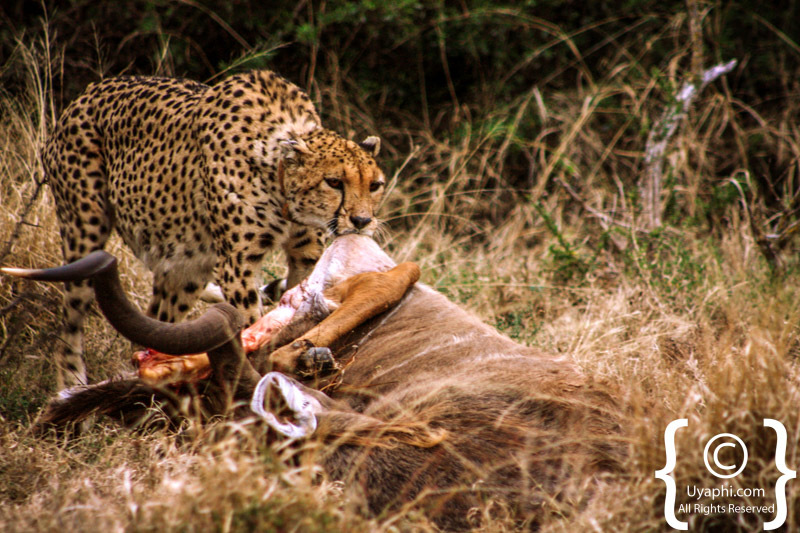 In the case of the cheetah, and before its reintroduction, the last wild one had been shot out 125 years before. Bellini arrived at Samara in December 2011 from Waterkloof Game reserve in the Waterberg. She was six years nine months at the time. She was part of a metapopulation program with Endangered Wildlife Trust where cheetahs are exchanged between game reserves to strengthen the gene pool. She duly produced two cubs in the winter of July 2012. Sadly, both died within a few days due to exposure to the bad weather. Whether people attributed certain anthropomorphic qualities to her, Bellini seemed to decline physically and mentally after this. In February 2013 her condition was very poor, and she was darted to examine her more closely. Several of her teeth were broken off, and others were worn right down. She was given antibiotics and vitamin supplements and was assisted in feeding in the natural bush for a few weeks. 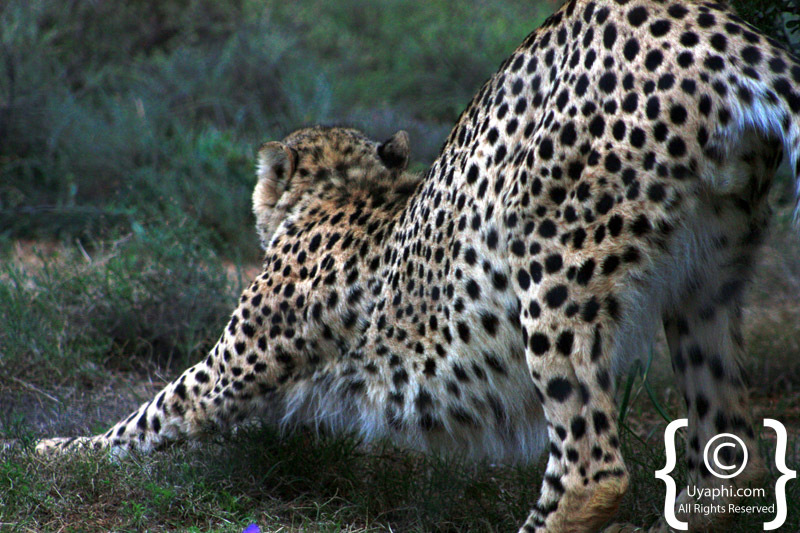 Despite a slow recovery, she produced a further cub in June 2013 near the Karoo Lodge on the bank of the Milk River. Unfortunately, she abandoned the cub, and her condition worsened. She was given assisted feeding every second day. A decision was made to capture her on Monday 19th August and place her in the Samara cheetah boma. Very sadly, when a team went to capture her, she was found dead. She had died the previous day.Bellini, in her prime, was a big, proud cat that epitomised the renewal of life over the plains and mountain ridges of the Great Karoo. She will be missed but her female cub, Nala, is her legacy.